The log cabin that Galaa Erdenechimeg built looks sturdy—a rudimentary structure with four low sides, a stove planted in the middle, and solar panels propped next to its steel door. Outside, conifer boughs bristle with hoar frost, rendered otherworldly by the frigid winter air. Two reindeer, tied to the trees, nose around the ice-covered ground in search of lichen. Erdenechimeg says his new home was an experiment in trial and error. “Someone who’s more experienced than me would have probably only taken two to three days, but I took five months,” he says. His inexperience is understandable. For 26-year-old Erdenechimeg and his family, the cabin is a break from tradition. He is a Dukha, one of a dwindling group of about 300 nomadic reindeer herders that live in northern Mongolia’s snow forest, or taiga, located in Khovsghol Province. The Dukha have long structured their lives around the reindeer’s grazing patterns, sleeping in portable, canvas-lined teepees that can be assembled and disassembled in half a day. The cabin can’t be dismantled and carried away, but that’s part of its appeal. It offers stability in a changing world, one in which Erdenechimeg and his people are being forced to choose between obeying new laws or centuries-old traditions, between respecting conservation dictates at the cost of their livelihoods or hunting illegally, which may ultimately threaten the environment that has sustained them for generations. 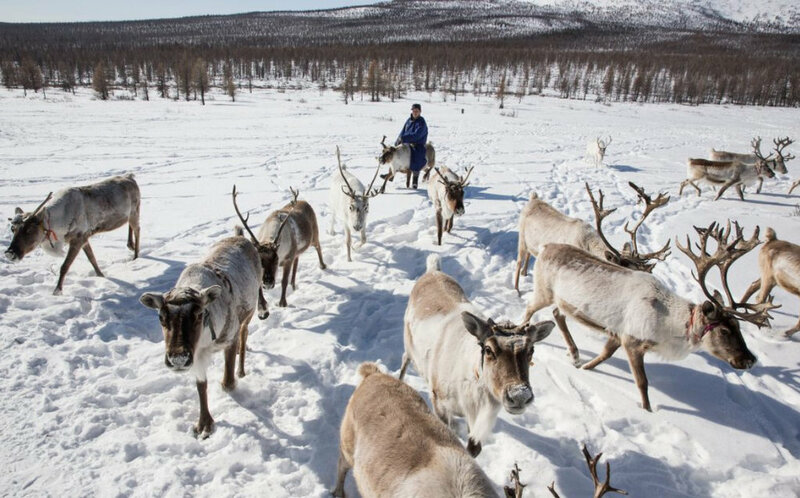 For more than 200 years, the Dukha have shaped their lives around the needs of their reindeer, crisscrossing the taiga throughout the year in search of conditions that keep the animals healthy. But in 2011, the Mongolian government created a protection zone in the taiga, intended to preserve land that had been increasingly impacted by mining and hunting. For the Dukha, the restrictions have felt like a moratorium on their very existence, a way of life deeply intertwined with the health of the ecosystem. Changes like these are playing out around the world, from jungles of the Congo Basin to rainforests in Canada to this small population of reindeer herders in Mongolia. Indigenous cultures predate political borders, yet government officials—faced with diminishing resources and looking to protect what’s left—sometimes find it necessary to impose restrictions on native lands. How they make those decisions, where they draw the lines, and whether they include indigenous people in the planning and implementation of conservation regulations can determine whether their efforts will ultimately fail or succeed.